LuViva is to be used on a referred population of women following an abnormal pap test, positive HPV test, or other symptomatic referral cause. The current cervical cancer screening paradigm has 100% women who have received an abnormal results from their initial cervical cancer screening method go onto diagnostic testing, which can include HPV testing, colposcopy, and/or biopsy. 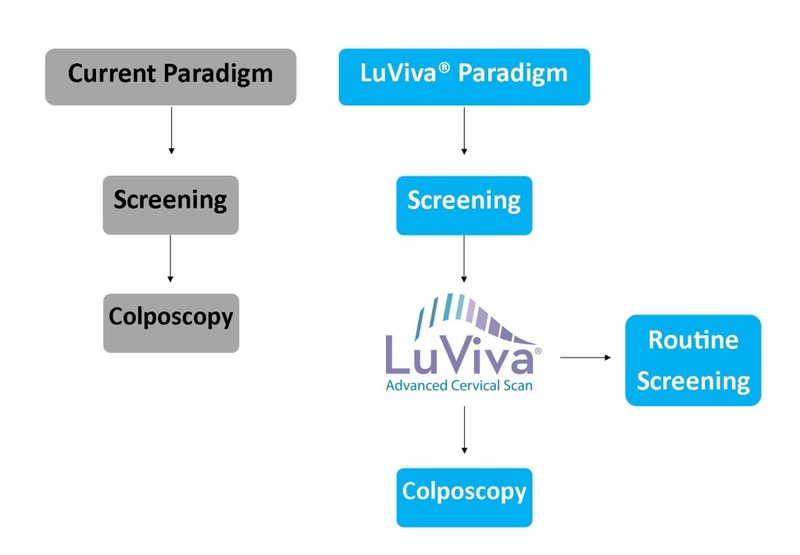 When adding LuViva to the cervical cancer screening process, LuViva acts as a triage point identifying women that can return to routine screening from those that should go onto further diagnostic testing. Based on clinical trials, 20% of women being referred onto additional testing will actually have disease. Of the remaining 80%, LuViva would be able to remove 35-40% of them from additional, unnecessary testing. Guided Therapeutics, Inc. is located in Norcross, Georgia, northeast of Atlanta.